New Delhi: To accelerate strategic disinvestments in central public sector enterprises (CPSEs), the cabinet committee on economic affairs (CCEA) mandated a panel headed by finance minister Arun Jaitley to oversee the asset sale process. The panel—a so-called alternative mechanism approved by the CCEA at a meeting on Wednesday—may also help the government raise more revenue from asset sales. The additional revenue will be handy in what could be a fiscally challenging year, with the Reserve Bank of India (RBI) halving to Rs30,659 crore the dividend it will pay the government, an expected shortfall in revenue from the telecom industry and higher expenditure on allowance payouts to central government employees. Minister for road transport and highways Nitin Gadkari and the ministers to whose departments CPSEs report will be members of the panel, which will decide on matters relating to terms and conditions of the strategic sale—from calling for expressions of interest from potential buyers to inviting financial bids. Strategic disinvestment implies the sale of a substantial portion of government stake in a CPSE with transfer of management control. The new mechanism will empower the so-called core group of secretaries on disinvestment (CGD) to take policy decisions on procedural issues and to consider deviations which are necessary from time to time for effective implementation of the CCEA’s decisions. Earlier this year, the government asked policy think tank NITI Aayog to identify CPSEs for strategic disinvestment and advise it on the mode of sale, percentage of stake to be sold and the method for valuation. The CGD has been set up to consider the recommendations of NITI Aayog to facilitate a decision by the CCEA on strategic disinvestment and to supervise the implementation process. “Without the alternative mechanism, we would have to go to the CCEA at each stage for clearance during the process of selling stake in a CPSE. Now we will approach the CCEA for clearance only after a buyer is finalized under the new mechanism. This will speed up the process of strategic disinvestment," a finance ministry official said on condition of anonymity. The government has set up an alternative mechanism with the same composition to decide on minority stake sales in CPSEs. The government has so far shortlisted BEML Ltd, Scooters India Ltd and Pawan Hans Ltd and three units of the Steel Authority of India Ltd for strategic disinvestment this year. 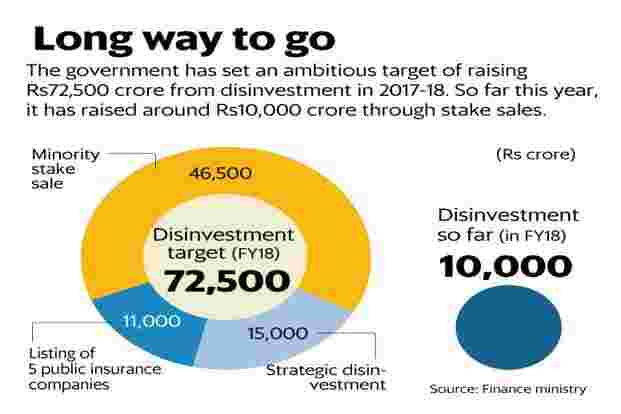 The government has set an ambitious target of raising Rs72,500 crore from disinvestment in 2017-18, including Rs15,000 crore from strategic asset sales. So far this year, the government has raised around Rs10,000 crore through stake sales. Strategic disinvestments have in the past been controversial and often become entangled in legal tussles. It is crucial to get the valuation right in a strategic disinvestment, said Prithvi Haldea, chairman and managing director of Prime Database, which tracks primary market activity. “While the government may decide the value of the CPSE looking at its past and present performance, once the company starts performing well in the hands of the private owner, people start accusing the government of underpricing national assets. To overcome this vicious cycle, government should opt for competitive bidding in the most transparent manner so that allegations of favouritism could be avoided," he said.